As a personal injury attorney in Savannah since 1984, Howard has gained high recognition for handling large cases such as catastrophic injury, usually relating to Traumatic Brain Injuries in young children. In fact, his walls are covered with photos of clients he has helped. Howard and his sister realized that all of the children on his walls were victims of TBIs, specifically due to car accidents. How to Prevent TBIs in Children? 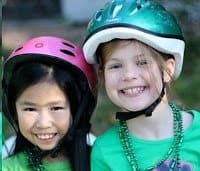 Understanding that these incidents were happening in car accidents with their heads unprotected, Howard decided to create the Justice for Children Foundation and its “Heads in Helmets” campaign, as TBIs from bicycle accidents are more preventable. Starting in 1999, Howard and the Spiva Law Group have given away tens of thousands of helmets, where they have teamed up with other law firms to be ambassadors and take this campaign country-wide. Whether at a festival or community gathering, Howard and the Spiva Law Group sponsor safety courses with local police and fire stations, helmet decorating stations, and more! Howard and the Spiva Law Group have been recognized for their impact and contribution within the community and even more recently by the American Justice Association. For more information about Howard Spiva and the Spiva Law Group, please contact the firm using the contact form or view our “about us” section on the website.